This 1934 $5,000 Dallas note has ser.# K00000232A and was last in a CGA-62 holder. This is one of the nicest 1934 $5,000 bills you will ever see. It is from the very tough and popular Dallas District. Dallas only has 25 examples known and is one of the most sought after districts, especially when it is an uncirculated note. As a bonus it is also of the Light Green Seal varity (LGS). There are no rips, tears, pinholes, bank stamps or missing pieces. A truly unmolested and rare note. This famous $5,000 has been graded as a CGA Uncirculated-62. Check out the vivid colors on the light green seal and serial numbers and the nice margins that surrounds this beauty. This is truly a collectors dream. This 1934 $5,000 Philadelphia (3 Known) note has ser.# C00000100A and would grade a solid EF. This is one of the rarest 1934 $5,000 notes known. This rare puppy is from the scarce Philadelphia District and has a fancy serial number of C00000100A. As you can see by the scans it is in pristine condition with no visible issues. There are actually 4 Phillys in the census, but one of them is suspect with no known data. So in real life there are only 3 available for collectors. ONLY THREE! There are five 1913 V nickels and they sell for over $2.5 million each. What is wrong with this picture? This may be your only chance to own one of these three 1934 $10,000 bills. There are only 151 known $5,000 in all series and districts. You will never see these notes in auctions, especially a Philly. This is a super nice and rare 1934 $5,000 bill from the tough Richmaond district. There are only 9 known from this district. This note was in a Lyn Knight auction on 2/26/04 as lot# 1993 and sold for $43,700 as a Choice Uncirculated. Any 1928 $5,000 note is a favorite of mine. This is a rare 1928 $5,000 from the Atlanta district. There are only eight known to exist. This note is in a PMG VF-20 holder and I think that is undergraded. I bought this one in July of 2011 and it now resides in a private long term collection. This note is part of the famous "Dallas Hoard" that Jhon E Cash discovered in May of 2005. The Dallas Hoard consisted of ten 1934 Dallas $10,000 bills and seven 1934 Dallas $5,000 bills. This note now resides in a PCGS-64PPQ holder. This note is part of the famous "Dallas Hoard" that Jhon E Cash discovered in May of 2005. The Dallas Hoard consisted of ten 1934 Dallas $10,000 bills and seven 1934 Dallas $5,000 bills. This note was in a CGA-64 holder. This note is part of the famous "Dallas Hoard" that Jhon E Cash discovered in May of 2005. The Dallas Hoard consisted of ten 1934 Dallas $10,000 bills and seven 1934 Dallas $5,000 bills. I sold this note in October of 2005. It now resides in a PCGS-55PPQ holder. This note is part of the famous "Dallas Hoard" that Jhon E Cash discovered in May of 2005. The Dallas Hoard consisted of ten 1934 Dallas $10,000 bills and seven 1934 Dallas $5,000 bills. This note was in a CGA-64 holder. This note is part of the famous "Dallas Hoard" that Jhon E Cash discovered in May of 2005. The Dallas Hoard consisted of ten 1934 Dallas $10,000 bills and seven 1934 Dallas $5,000 bills. I sold this note in December of 2005 and it is now in a PCGS-64PPQ holder. This is super nice 1934 $5,000 Dallas note that is currently in a PCGS-53PPQ holder. I have owned this note twice. I love the cool solid serial number of K00000088A, as that was Drew Pearsons number when he was with the Dallas Cowboys. It is also a pure original note, never doctored. This 1934 $5,000 FRN note is from Chicago and has ser.# G00000693A. I would graded this a solid VF. This is a real and rare US 1934 $5,000 bill from the ever popular Chicago district. It features a Light Green Seal (LGS) variety. The three digit low serial number is G00000963A. Recently I repurchased this nice $5,000 bill from a past client who had it for some time. This $5,000 bill is not in a PMG or PCGS holder because the grading companies were not around when he purchased the note. I will probably get it graded when I go to Chicago at the end of April. That is unless I sell it first. The $5,000 is the second highest denomination bill ever released to the public by the US government, the $10,000 bill being the highest denomination. 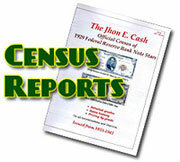 There are only 167 $5,000 notes known to exist according to the official Jhon E Cash $5,000 & $10,000 Census. It is very difficult to locate a mid grade nice problem free $5,000. So may of these rare bills have been cleaned, pressed, repaired or restored. This one does not have any pinholes, bank marks, tears or missing pieces. It has never been cleaned, pressed or doctored. It is still in its original condition excluding the normal circulation. That is because it has never been through the normal dealer channel. Once that happens you can bet it will be worked on and put into a much higher graded holder. This Chicago $5,000 note was last seen in a CGA-35 holder. I purchased this Chicago $5K note in May of 2003. It now resides with a long term collector. This is a super cool 1934 $5,000 note with a solid and fancy serial number. This note sold on 2/2002 for $22,500 at a show. It once resided in a CGA-40 holder and now resides in a PMG-20 holder. This Chicago $5,000 note sold for $31,000 in June of 2002. A lot of money at the time. It was last in a CGA-40 holder with restored comments. There are 50 1934 $5K Chicago notes known. I do not have a lot of information on this note other than it was on ebay on 10/26/2010 as a EF/VF. This note is part of the famous "Dallas Hoard" that Jhon E Cash discovered in May of 2005. The Dallas hoard consisted of ten 1934 Dallas $10,000 bills and seven 1934 Dallas $5,000 bills. Fr.-2221 1934 $5,000 Dallas Ser. K00000039A PCGS EF45. This famous 1934 $5,000 bill is from one of the most popular districts, Dallas. It was originally sold in a CAA Auction in Chicago on 4/18/2008 as lot #14866 and it sold for $109,250. Dallas is one of the most sought after districts for collectors. $5,000 bills commonly sell for more than its big brother the $10,000 bill because there are much less of them known. The serial number of this nice PCGS graded Extra Fine note is K00000039A and it is in a PCGS EF-45 holder. There are no rips, tears, pinholes or bank marks. I owned this Dallas $5K note and sold it in Feb. of 2004. It was in a CGA-60 holder. There are 30 1934 $5K notes known. Fr.-2231 1934 $10,000 FRN Boston Ser. A00000103A PCGS EF-45. This one is a very nice and lightly circulated 1934 $10,000 FRN from the tougher Boston District. Unlike the Binion $10K notes from the New York District with 100 known, there are currently only 12 Boston's known by serial number. This note with a serial number of A000000103A is new to the census and makes it the twelfth note known. PCGS, a highly respected independent third party grading service has graded this Boston $10K note as a VF-45 with no issues of any kind. There are absolutely no rips, tears, pinholes, bank stamps or any other major issues with this beautiful example. Only a few corner folds keep this Boston $10K note from a higher grade. Check the larger scans for a better look in detail. Check out the original color and even margins and centering. This is an original note all the way. Fr.-2231 1934 $10,000 Boston Ser. # A00000140A CGA-64. This one is a very nice and lightly circulated 1934 $10,000 FRN from the tougher Boston District. Anybody need $10,000? I've got just what your looking for. How about a rare Boston 1934 $10,000 bill with a low 3-digit serial number of A00000140A. This is the 140th 1934 $10,000 bill ever printed and issued. This is much rarer than any of the 100 Binion 1934 $10,000 bills. It has been graded as a CGA-64 which would make it the finest graded of the 11 known. I've owned this rare Boston $10,000 note two other times. This 1934 $10,000 New York (Binion) Ser. # B00002023A CGA-64. This note hails from the Famous Binion Hoard that was displayed from 1954 to 1999 at the Las Vegas Hotel and Casino. There were 100 $10,000 New York notes on display in the famous Inverted Horseshoe located at the entrance of the casino. This display was Las Vegas’ most celebrated attraction for many years. People from all over the world came to have their picture taken in front of the display. Charles Manson was one of the ones who had his picture taken with the display. All 100 of the notes were dismantled and sold off in late 1999 to pay off some of the debt the Casino was liable for. This note is in a CGA holder GEM-65. And the serial number is B00002652A. I am currently writing a book on the US $5,000 and $10,000 bills. There is a chapter in the book that gives the history of Benny Binion and the famous Inverted Horseshoe. This is part of Americana history. I sodl this nice Binion in August of 2004. This 1934 $10,000 New York (Binion) Ser. # B00002260A CGA-64. This note hails from the Famous Binion Hoard that was displayed from 1954 to 1999 at the Las Vegas Hotel and Casino. There were 100 $10,000 New York notes on display in the famous Inverted Horseshoe located at the entrance of the casino. This display was Las Vegas’ most celebrated attraction for many years. People from all over the world came to have their picture taken in front of the display. Charles Manson was one of the ones who had his picture taken with the display. All 100 of the notes were dismantled and sold off in late 1999 to pay off some of the debt the Casino was liable for. This note is in a CGA holder GEM-65. And the serial number is B00002652A. I am currently writing a book on the US $5,000 and $10,000 bills. There is a chapter in the book that gives the history of Benny Binion and the famous Inverted Horseshoe. This is part of Americana history. I purchase this one in Sept of 2004 and sold it in December of 2004. This 1934 $10,000 note is in a PCGS Gem-65 holder with serial # B00002267A. It is part of a 2 note 10k Gem 65 set. You are looking at one of the nicest sets of PCGS-65 GEM set of 1934 $10,000 bills known to exist. They both are from the famous Binion Hoard of 100 New York $10,000 bills.. They were in the Inverted Horseshoe that was on display in the Binion Hotel and Casino in Las Vegas from 1966 to 1999. What makes this set so unique is that they are in consecutive serial numbers and they are both GEMS. Most people do not know this, but the 100 New York Binion $10,000 notes were not in consecutive serial number sequence and not all of them were in high grade such as the case of the two GEMS. To own a piece of Americana history is priceless as even the billionaires of today can’t boast of. There are only so many to go around. This 1934 $10,000 New York (Binion) has Ser. # B00002272 and was last in a PCGS-63 RED. This note hails from the Famous Binion Hoard that was displayed from 1954 to 1999 at the Las Vegas Hotel and Casino. There were 100 $10,000 New York notes on display in the famous Inverted Horseshoe located at the entrance of the casino. This display was Las Vegas’ most celebrated attraction for many years. People from all over the world came to have their picture taken in front of the display. Charles Manson was one of the ones who had his picture taken with the display. All 100 of the notes were dismantled and sold off in late 1999 to pay off some of the debt the Casino was liable for. This note is in a CGA holder GEM-65. And the serial number is B00002652A. I am currently writing a book on the US $5,000 and $10,000 bills. There is a chapter in the book that gives the history of Benny Binion and the famous Inverted Horseshoe. This is part of Americana history. This 1934 $10,000 New York (Binion)note has ser. # B00002652A and was last in a CGA-65 holder. This note hails from the Famous Binion Hoard that was displayed from 1954 to 1999 at the Las Vegas Hotel and Casino. There were 100 $10,000 New York notes on display in the famous Inverted Horseshoe located at the entrance of the casino. This display was Las Vegas’ most celebrated attraction for many years. People from all over the world came to have their picture taken in front of the display. Charles Manson was one of the ones who had his picture taken with the display. All 100 of the notes were dismantled and sold off in late 1999 to pay off some of the debt the Casino was liable for. This note is in a CGA holder GEM-65. And the serial number is B00002652A. I am currently writing a book on the US $5,000 and $10,000 bills. There is a chapter in the book that gives the history of Benny Binion and the famous Inverted Horseshoe. This is part of Americana history. This 1934 $10,000 New York (Binion) Ser. # B00002679A PMG-64. This note hails from the Famous Binion Hoard that was displayed from 1954 to 1999 at the Las Vegas Hotel and Casino. There were 100 $10,000 New York notes on display in the famous Inverted Horseshoe located at the entrance of the casino. This display was Las Vegas’ most celebrated attraction for many years. People from all over the world came to have their picture taken in front of the display. Charles Manson was one of the ones who had his picture taken with the display. All 100 of the notes were dismantled and sold off in late 1999 to pay off some of the debt the Casino was liable for. This note is in a CGA holder GEM-65. And the serial number is B00002652A. I am currently writing a book on the US $5,000 and $10,000 bills. There is a chapter in the book that gives the history of Benny Binion and the famous Inverted Horseshoe. This is part of Americana history. I purchased this note in June of 2005 and sold it in Jan of 2006. This 1934 $10,000 New York (Binion) has Ser. # B00003031A and was last seen in a CGA-62. This note hails from the Famous Binion Hoard that was displayed from 1954 to 1999 at the Las Vegas Hotel and Casino. There were 100 $10,000 New York notes on display in the famous Inverted Horseshoe located at the entrance of the casino. This display was Las Vegas’ most celebrated attraction for many years. People from all over the world came to have their picture taken in front of the display. Charles Manson was one of the ones who had his picture taken with the display. All 100 of the notes were dismantled and sold off in late 1999 to pay off some of the debt the Casino was liable for. This note is in a CGA holder GEM-65. And the serial number is B00002652A. I am currently writing a book on the US $5,000 and $10,000 bills. There is a chapter in the book that gives the history of Benny Binion and the famous Inverted Horseshoe. This is part of Americana history. I have owned this Binion note three times and last sold it in June of 2003. This 1934 $10,000 New York (Binion) Ser. # B00003066A CGA-64. This note hails from the Famous Binion Hoard that was displayed from 1954 to 1999 at the Las Vegas Hotel and Casino. There were 100 $10,000 New York notes on display in the famous Inverted Horseshoe located at the entrance of the casino. This display was Las Vegas’ most celebrated attraction for many years. People from all over the world came to have their picture taken in front of the display. Charles Manson was one of the ones who had his picture taken with the display. All 100 of the notes were dismantled and sold off in late 1999 to pay off some of the debt the Casino was liable for. This note is in a CGA holder GEM-65. And the serial number is B00002652A. I am currently writing a book on the US $5,000 and $10,000 bills. There is a chapter in the book that gives the history of Benny Binion and the famous Inverted Horseshoe. This is part of Americana history. I sold this note in Jan of 2004. I bought this Dallas $10K note in July of 2005. It was then in a CGA-64 holder. I loved the serial number. This note is part of the famous "Dallas Hoard" that Jhon E Cash discovered in May of 2005. The Dallas hoard consisted of ten 1934 Dallas $10,000 bills and seven 1934 Dallas $5,000 bills. I sold this note in October of 2005. It now resides in a PMG-25 holder. This note is part of the famous "Dallas Hoard" that Jhon E Cash discovered in May of 2005. The Dallas hoard consisted of ten 1934 Dallas $10,000 bills and seven 1934 Dallas $5,000 bills. I sold this note in October of 2005. It now resides in a PMG-40 holder. This note is part of the famous "Dallas Hoard" that Jhon E Cash discovered in May of 2005. The Dallas hoard consisted of ten 1934 Dallas $10,000 bills and seven 1934 Dallas $5,000 bills. I sold this note in October of 2005. It now resides in a PMG-40 holder. This note is part of the famous "Dallas Hoard" that Jhon E Cash discovered in May of 2005. The Dallas hoard consisted of ten 1934 Dallas $10,000 bills and seven 1934 Dallas $5,000 bills. I sold this note in October of 2005. It now resides in a PCGS-62 holder with Great Color notated. This note is part of the famous "Dallas Hoard" that Jhon E Cash discovered in May of 2005. The Dallas hoard consisted of ten 1934 Dallas $10,000 bills and seven 1934 Dallas $5,000 bills. I sold this note in October of 2005. It now resides in a PMG-63PPQ holder with Great Embossing notated. This note is part of the famous "Dallas Hoard" that Jhon E Cash discovered in May of 2005. The Dallas hoard consisted of ten 1934 Dallas $10,000 bills and seven 1934 Dallas $5,000 bills. I sold this note in October of 2005. It now resides in a PMG-40 holder. This note is part of the famous "Dallas Hoard" that Jhon E Cash discovered in May of 2005. The Dallas hoard consisted of ten 1934 Dallas $10,000 bills and seven 1934 Dallas $5,000 bills. I sold this note in October of 2005. The photo you are viewing is as I bought it and before the note was repaired and cleaned up.It now resides in a PCGS-40 holder. Nice job! This 1934 $10,000 New York (Binion) Ser. # B00003066A CGA-64. This note hails from the Famous Binion Hoard that was displayed from 1954 to 1999 at the Las Vegas Hotel and Casino. There were 100 $10,000 New York notes on display in the famous Inverted Horseshoe located at the entrance of the casino. This display was Las Vegas’ most celebrated attraction for many years. People from all over the world came to have their picture taken in front of the display. Charles Manson was one of the ones who had his picture taken with the display. All 100 of the notes were dismantled and sold off in late 1999 to pay off some of the debt the Casino was liable for. This note is in a CGA holder GEM-65. And the serial number is B00002652A. I am currently writing a book on the US $5,000 and $10,000 bills. There is a chapter in the book that gives the history of Benny Binion and the famous Inverted Horseshoe. This is part of Americana history. I sold this note in Jan of 2004. This 1934 $10,000 N.Y. note is part of the famous Binion Hoard and has ser.# B00003071A. It was last in a PCGS-64 holder. You are viewing something that you may never ever see again. Ultra High-Denominations hard to locate in uncirculated condition. I sold this Uncirculated beauty for $137,500 in early of 2008. How times have changed. This is a deal that someone out there is going to remember for the rest of their lives. Reguardless of your wealth very few people get a chance to own the largest denomination the US government ever released to the public. The serial number is B00003071A and it is in a PCGS-64 holder. I am currently finishing a lengthy book on the History of the U.S. $5,000 and $10,000 bills. There is a special chapter in the book that covers in detail the history of Benny Binion Sr. and the famous Inverted Horseshoe display of the one hundred (100) $10,000 New York notes that were on public display near the entrance of the Binion Hotel and Casino in Las Vegas from 1954 to 1999. The Binion display was Las Vegas’ most celebrated attraction for many years. People from all over the world came to have their picture taken in front of the display. Amongst the celebrities was Charles Manson who had his picture taken with the display. Fr.-2231 1934 $10,000 New York (Binion Note) Ser. B00003072A PCGS-63. This note hails from the Famous Binion Hoard that was displayed from 1954 to 1999 at the Las Vegas Hotel and Casino. There were 100 New York $10,000 notes on display in the famous Inverted Horseshoe. All 100 of the notes were displayed from 1966 to 1999 and was locatedat the entrance of the Horseshoe Casino and Hotel This display was Las Vegas’ most celebrated attraction for many years. People from all over the world came to have their picture taken in front of the display. Amoungst the celerbities was Charles Manson who had his picture taken with the display. You will not find an uncirculated $10,000 Binion Note for this price anywhere on any website or currency show or on the internet, I guarantee it! This is the abvsolute best price anywhere...and I have it in stock! All 100 of the notes were dismantled and sold off in December 1999 to pay off some of the debt the Casino was liable for. This note is in a PCGS-63 holder. And the serial number is B00003072A. This 1934 $10,000 New York (Binion) has Ser.# B00003072A and resides in PCGS-63. This note hails from the Famous Binion Hoard that was displayed from 1954 to 1999 at the Las Vegas Hotel and Casino. There were 100 $10,000 New York notes on display in the famous Inverted Horseshoe located at the entrance of the casino. This display was Las Vegas’ most celebrated attraction for many years. People from all over the world came to have their picture taken in front of the display. Charles Manson was one of the ones who had his picture taken with the display. All 100 of the notes were dismantled and sold off in late 1999 to pay off some of the debt the Casino was liable for. This note is in a CGA holder GEM-65. And the serial number is B00002652A. I am currently writing a book on the US $5,000 and $10,000 bills. There is a chapter in the book that gives the history of Benny Binion and the famous Inverted Horseshoe. This is part of Americana history. I have owned this nte three times and last sold it in March of 2011. Here is a 1934 $10,000 Philadelphia note with ser.# C00000032A and currently resides in a PMG VF-30 holder. This 1934 $10,000 Philadelphia FRN is part of the famous serial number 32 series of Ultra-High denomination sets. This note has been graded as a PMG VF-20 by PMG. It is also from the Philadelphia district of which there are only 4 known. With only 4 known that makes this one of the rarest $10K available for collectors. As far as I can tell it may the finest known. Check the scans for additional details. There are no noticable problems such as no rips, tears, pinholes or tears.I get it graded. A great note for a great price! How about a very rare 1928 $10,000 Atlanta FRN with a total of 6 1928s avail. It has ser. # F00000071A and resides in a PMG VF-20 holder. Here is one of the 8 known 1928 $10,000 bills. The unique 1928 Boston $10,000 is permanently impounded and on display in the National Smithsonian in Washington DC and the 1928 $10,000 San Francisco is permantely impounded and on display at the Federal Reserve Bank of San Francisco. That leaves a mere 6 1928 $10,000 bills for the rest of the collecting world. A mere 6 are all that is available. Heck the 1913V nickel has only 5 known and they sell for over $2.5 million each, when they are at auction. What is up with that? This 1928 Atlanta $10,000 bill has the appealing 2-digit number of F00000071A. It has been unfairly graded as a PMG VF-20. It doesnt take a brain scientist to see the eye appeal factor is easily that of an Extra Fine-45 note. Fr.-2231 1934 $10,000 (LGS) Chicago FRN Ser. G00001081A PMG EF-45. This one is a very nice and lightly circulated 1934 $10,000 FRN from the ever popular Chicago District. This is a really nice example of the 1934 $10,000 bill from the Chicago District. There are only 25 examples known from this district compared to 103 from the New York district. Chicago has always been one of my favorite districts, next to the Dallas district. Very rarely do I come across a nice VF to EF example of a $10,000 without any issues. I’ve bought and sold over 150 $5,000 and $1,000 bills. Most of them are in uncirculated condition or in VF grade or lower with major issues like rips, tears, pinholes, etc. There are only a very few in the mid grade range with not any issues on them at all. This is one of those few. This Chicago $10,000 is new to the census and was recently discovered in a coin shop in the Midwest. An older gentleman walked to the coin shop in with his coins and two $10,000 bills. The owner called me and here they are. This beautiful Extra Fine example has absolutely no rips, tears, pinholes, bank markings, missing pieces or holes. This is a good example of a three-fold Extra Fine. You won’t be able to see them but there are three folds somewhere on this note. Check the large scans and see the beautiful boardwalk margins. The creamy white paper with deep inks really shows up clearly, especially on the front. Fr.-2231 1934 $10,000 Chicago FRN Ser. G00000894A VF/XF. This is another nice $10,000 bill that I just re acquired from a past client. This is a 1934 $10,000 bill from the famed city of Chicago. It also features the Light Green Seal Varity (LGS).The serial number is G0000894A. This is a well known and famous pedigreed note. This is one of the three $10,000 bills that were discovered in 1999 in Houston Texas in a Bank One safety deposit box along with seven $5,000 bills and 128 $1,000 and over 100 $500 bills. It is part of the infamous "Bank One Hoard." I would say this is an Very Fine/Extra Fine note that is totally original. It has never been pressed, cleaned or doctored in any way. You just do not find many ultra high denoms that have eluded the cleaners or note doctors. It has not been graded because the collector purchased it years before PMG or PCGS was around. Funny thing is that most collectors cut them out of holders anyway when they purchase them. As they say, let them breathe. Any way as you can see from the large scans there are no rips, pinholes, bank marks or missing pieces. It still retains most of its paper quality and has nice corners. The inks are just perfect for the grade. For accuracy there is a tiny, tiny margin tear on the right side in the margin only and it DOES NOT go into the design. In no way does it distract from the overall eye appeal and beauty of this rare note. The US $10,000 bill is the largest denomination that the Treasury Department ever released to the public. They were printed from 1928 to 1946. In July of 1969 President Nixon signed a law that prohibited the government from releasing anything higher that a $100 bill to the banks. Most of them have been turned in and destroyed by the Treasury department. There are appox 200 known to exist according to the official census. Most of the $10K notes to survive include the 100 New York Binion notes from the famous Inverted Horseshoe that was the center of attraction at Benny Binion’s Hotel and Casino in Las Vegas from 1964 to 1999. Fr.-2231 1934 $10,000 Chicago FRN Ser. G00000894A VF/XF. This is another nice $10,000 bill that I just re acquired from a past client. This is a 1934 $10,000 bill from the famed city of Chicago. It also features the Light Green Seal Varity (LGS).The serial number is G0000894A. This is a well known and famous pedigreed note. This is one of the three $10,000 bills that were discovered in 1999 in Houston Texas in a Bank One safety deposit box along with seven $5,000 bills and 128 $1,000 and over 100 $500 bills. It is part of the infamous "Bank One Hoard." I would say this is an Very Fine/Extra Fine note that is totally original. It has never been pressed, cleaned or doctored in any way. You just do not find many ultra high denoms that have eluded the cleaners or note doctors. It has not been graded because the collector purchased it years before PMG or PCGS was around. Funny thing is that most collectors cut them out of holders anyway when they purchase them. As they say, let them breathe. Any way as you can see from the large scans there are no rips, pinholes, bank marks or missing pieces. It still retains most of its paper quality and has nice corners. The inks are just perfect for the grade. For accuracy there is a tiny, tiny margin tear on the right side in the margin only and it DOES NOT go into the design. In no way does it distract from the overall eye appeal and beauty of this rare note. The US $10,000 bill is the largest denomination that the Treasury Department ever released to the public. They were printed from 1928 to 1946. In July of 1969 President Nixon signed a law that prohibited the government from releasing anything higher that a $100 bill to the banks. Most of them have been turned in and destroyed by the Treasury department. There are appox 200 known to exist according to the official census. Most of the $10K notes to survive include the 100 New York Binion notes from the famous Inverted Horseshoe that was the center of attraction at Benny Binion’s Hotel and Casino in Las Vegas from 1964 to 1999. Fr.-2231 1934 $10,000 Chicago (LGS) Ser. G00001087A PMG EF-40. This is a really nice example of the 1934 $10,000 bill from the Chicago District. There are only 25 examples known from this district compared to 103 from the New York district. Chicago has always been one of my favorite districts, next to the Dallas district. Very rarely do I come across a nice VF to EX example of a $10,000 without any issues. I’ve bought and sold over 150 $5,000 and $1,000 bills. Most of them are in uncirculated condition or in VF grade or lower with major issues like rips, tears, pinholes, etc. There are only a very few in the mid grade range with not any issues on them at all. This is one of those few. This Chicago $10,000 is new to the census and was recently discovered in a coin shop in the Midwest. An older gentleman walked to the coin shop in with his coins and two $10,000 bills. The owner called me and here they are. This beautiful Extra Fine example has absolutely no rips, tears, pinholes, bank markings, missing pieces or holes. This is a good example of a three-fold Extra Fine. You won’t be able to see them but there are three folds somewhere on this note. Check the large scans and see the beautiful boardwalk margins. The creamy white paper with deep inks really shows up clearly, especially on the front. Fr.-2231 1934 $10,000 Chicago FRN Ser. G00001636A CGA GEM-65. This is one of those rare finds you never see offered for sale on any website or at any major auction. This is a 1934 $10,000 bill from the popular Chicago district. The serial number of this Light Green Seal $10K bill is G00001636A and it is in a CGA-65 GEM holder. This Chicago note is also part of the famous Bank One Hoard that was discovered in Houston in a safety deposit box in 1999 along with a few $5,000 and several hundred $500 and $1,000 dollar bills. This is the second time I've owned this CGA GEM $10,000 note. This Chicago $10,000 bill was last sold on August 7th of 2009 for $137,000. There is only a hand full or so GEM $10,000 bills known to exist and this is one of them. Most of the GEM $5,000 and $10,000 are sold privately and rarely offered in major auctions. Some people wait for years for one to come available and I'm sure there is some discriminate collector or investor just waiting to get their hand on this one. After this one is gone it may be many years before another one appears. It doesn’t matter how much money you have, you can only buy one when they are available. According to the census there are only 203 $10,000 bills and 165 $5,000 bills known. Fr.-2231 1934 $10,000 Dallas FRN Ser. # K00000032 A PMG-VF-30. This 1934 $10,000 Dallas FRN is part of the famous serial number 32 series of Ultra-High denomination sets. This note has been graded as a PMG VF-20 by PMG. It is also from the Dallas district of which there are only a few known. With only 4 known that makes this one of the rarest $10K available for collectors. As far as I can tell it may the finest known. Check the scans for additional details. There are no noticeable problems such as no rips, tears, pinholes or tears.